OSHatWork database for WHS, risk and skills management. The well-respected OSHatWorkTM program is high-quality software with comprehensive features that will help you to substantially improve your management of risk, workplace health & safety (WHS), worker training and certification, and more. government institutions like major public hospitals with up to thousands of personnel. Some of these organisations have been using OSHatWork since the very first version in 1997! It is tried and trusted software. 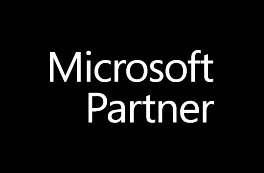 3 Piece Software Pty Ltd is a Microsoft Partner with 20 years experience designing, building and supporting ready-to-use and custom databases, particularly for the management of WHS, risk and personnel. Core WHS records covered include: incidents, hazards, corrective actions, medical certificates, rehabilitation, first aid, vaccinations and health tests. Also included in the current version is comprehensive handling of risk (of all types, not just WHS), audits, inspections, chemicals, training, certifications, and personnel. Version 5, which is due out later this year (and is a free update for all users), will add features for managing meetings (like staff consultations and toolbox talks, and the follow-up actions from these), events (such as trade shows and socials), equipment certifications, and planned equipment checks and maintenance. OSHatWork features are covered more extensively on the Features page. does not NEED cloud-hosting when it comes to the databases that they use. There are good reasons why, for some businesses, having databases on-premises, rather than cloud-hosted, is actually better. Think of it this way: you probably have many Microsoft Office files (such as Word and Excel documents) that you use on a daily basis, and the best place for these, for unintterupted ease of use and speed of access, is on the computers in your office. If they were on a cloud server then either: (a) you would have to download them each time you wanted to modify them, or (b) you'd have to accept that modifying them "online" might be slower and would be susceptible to any interruptions to your internet connection. The same is true for a database like OSHatWork. If it is installed on one computer, or on several, in your office, you will be able to use it there at any time (irrespective of whether you have an internet connection or not). You do not need a server to allow multiple people to share your OSHatWork database (but you can certainly utilise a server if you have one). If you do not have a server then you can simply designate one of your office computers (typically the admin computer since it is probably always turned on when people are at work) as the one which hosts the OSHatWork data. Then the front-end of OSHatWork is installed on all the computers on which you'd like to use the program and they will share the data stored on the admin computer. Installation is very simple and takes no more than ten to fifteen minutes for say five computers at one premises (and we'll provide help if you need it). If you have several premises, and you have a server, you can use Windows Remote Desktop to let people who are not in your main office use OSHatWork. So don't jump on the cloud bandwagon just because it's the latest thing. Instead make a rational assessment of whether you need cloud or not and, if you don't need cloud for your WHS, risk and HR database, then OSHatWork may be a very effective, and low-cost, solution for you. Please contact us if you'd like to discuss this. OSHatWork comes with a detailed Help System, and a pdf User Manual that you can print. Training is available to ensure that you get the most from OSHatWork (and there is a free one-hour training session to get you started when you purchase a new licence). We provide ongoing support via email or phone. We will also soon be releasing a series of training videos. thrilled to see how health and safety improves, and how performance and profitability are enhanced, through well-documented risk identification and control. an easily managed, very professional, high-quality Microsoft Access database appeals to you. Of course there is a lot to consider when deciding on new software. That's why we offer you a free trial to fully test the program with your own data (or with sample data that we provide for your convenience). For a quick initial assessment we can also demonstrate the program to you, live across the internet. If you'd like to book a demo, please get in touch. 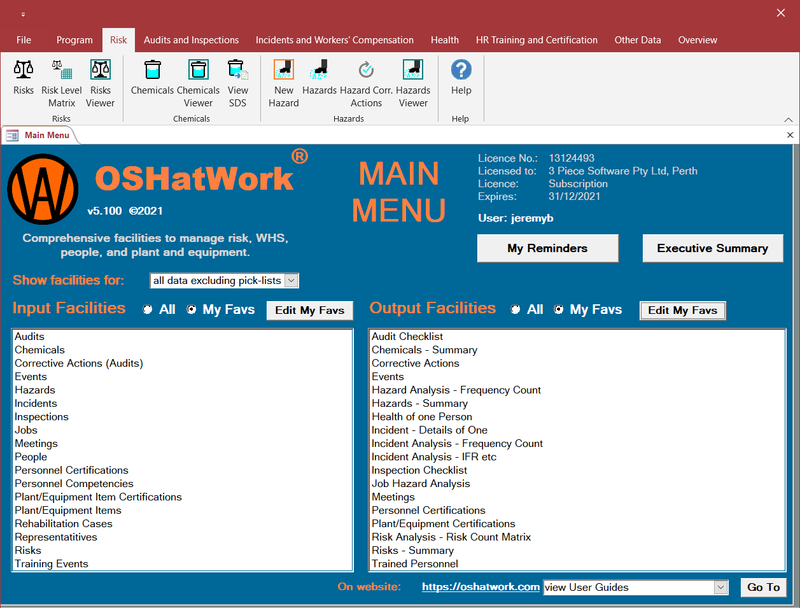 OSHatWork is also known to users as OSH at WorkTM, OSH@Work, OHS at Work, or OHS@Work. Registered trademark: "OSH at Work". Related, and claimed, but unregistered trademarks: "OSH@Work", "OHS at Work", "OHS@Work".